According to the publisher’s head of creative for digital and emerging products, Kylie Robertson, digital is about taking great stories to readers no matter where they happen to be. Robertson joined Penguin four years ago as its first creative digital director after building a career in transmedia storytelling using a combination of technologies and platforms. “It became immediately clear we’d need flexibility to meet changing reading behaviours,” she said during the recent Chief Digital Office Forum in Sydney. Robertson describes her role as “future-proofing stories” and one which touches four main areas of the business: Partnerships, platforms, products and experiences. Although she and her technical innovation lead sit within the marketing function, she operates as an internal startup, working across marketing, sales, publishing development and in-house IP teams to foster digital thinking through a creative and distribution context. Robertson’s first effort in 1998 was the ‘Girl Friday’ series for mobile devices, which secured her a distribution deal with Telstra for the launch of its mobile TV service. Customers would receive customised SMS messages and emails from the character based on their interactions with the site. From there, she started a digital production company and worked on redefining the way stories are told across multiple channels. For Robertson, digital at Penguin is about expanding the opportunities for creating, commercialising and delivering stories. As an example of how digital has changed the way Penguin invests in storytelling, Robertson pointed to a recent project with Lance Weiler, called ‘Lyka’s adventure’, about a robot from outer space coming to learn from children how to save her planet. The project tapped into multiple platforms to deliver an interactive and educational story to children across Australia including chapter books, a mobile app and a plush toy that could be activated by inserting a smartphone into its heart. Lyka visited primary schools across five states through the publisher’s travelling education lab, and children were enlisted to help the character collect information, figure out the people and places to visit, and design a way to get home. To do this, Penguin’s young readers division and teachers academy partnered to develop the initiative for the Australian education system. In the last 18 months, Penguin has also launched its ‘Dial-a-story’ initiative, involving two phone booths placed in physical locations and hooked up to Raspberry Pi devices. 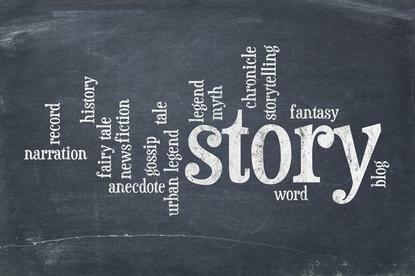 These are used by consumers to dial into one of five authors’ stories, as well as can leave their own story for an online archive of Australian stories. “It’s a unique way to engage with a story through a real-life and familiar object that took away digital screens,” Robertson said. Speaking to CMO following her presentation, Robertson said her role at Penguin was created to expand the focus of digital from ebooks to a wider canvas. Another major focus is disrupting linear storytelling in favour of more interactive engagement with content. “Having such a long history of marrying technology with audiences and storytelling has given me a unique position on this,” she said. “Technology has traditionally sat with IT, but it’s actually a very creative field and we’re seeing that more and more now through the startup culture, for example. I can translate and apply that thinking to an area of storytelling. But I also know how to commercialise products and I’m realistic about what you can and can’t do in digital. With digital delivery crossing over all aspects of the business, from marketing, product development to distribution, Robertson agreed questions have been raised as to who is responsible for what. The Lyka and dial-a-book projects, for example, are both marketing activities and storytelling in their own right. “Marketing is product is marketing,” Robertson continued. “When you start to look at this digitised content, you can’t separate them. Some of the work I’m looking at currently is tying together these multichannel networks for kids and adults. I’m looking at content distribution, experiences, and it’s a combined effort between the marketing and product teams. What underpins all of these efforts is audience engagement, Robertson said. “Every piece of strategy I work on is focused on audience, because that allows us to remain adaptive and nimble as things change underneath us all the time,” she said. “It’s about audiences and finding connection points to distribute content to them and engage in a two-way conversation. Robertson’s advice to organisations looking to tell their own brand story as digitisation transforms the way they interact with audiences is to retain authenticity. “You have to remain true to your brand,” she said. “You can’t have a scattergun approach in the way you tell a story, it has to be a concerted effort across each piece of the audience interaction and however you carve up your demographics.